Rinse the pork under cold water and pat dry with paper towels. Remove all visible fat and silver skin with a sharp boning knife. Tear a piece of 18-inch wide plastic wrap* 24 inches long. Lay the plastic wrap on the counter so the short side is facing you. See the Chef's Notebook at the end of this recipe for photos. Starting about 3 inches from the left side, lay the bacon slices vertically side by side slightly overlapping until you have created a “mat” equal to the length of the pork tenderloin (approx. 7 to 9 slices). Lay the tenderloin horizontally on the bacon about 1 inch from the bottom edge so the tenderloin lies across all the strips of bacon. 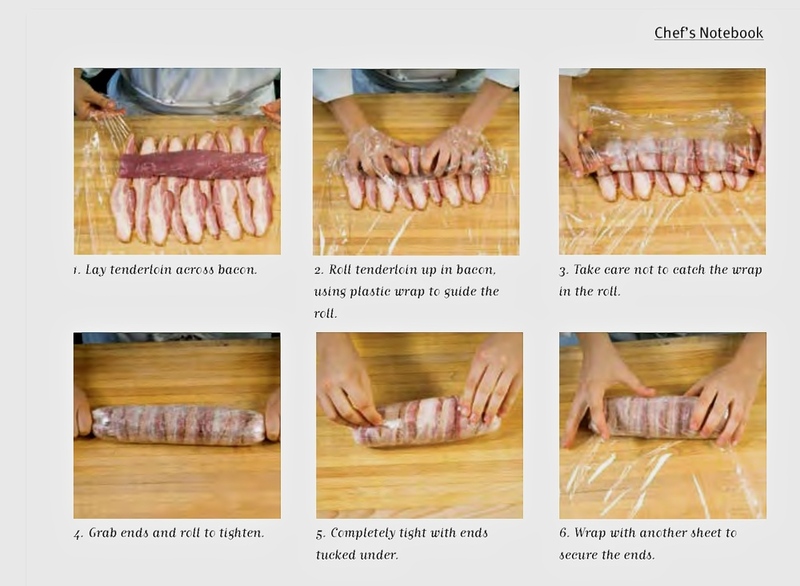 Using the plastic wrap, tightly wrap the bacon around the tenderloin until it overlaps and no bacon sticks out. Be careful not to wrap the plastic into the roll. Continue to roll up the plastic until it is completely wrapped around the tenderloin. With both hands, grab the ends of the plastic wrap and twist them by rolling the log away from you on the table until the entire roll becomes tight. Fold the twisted ends under the package and wrap the entire package in another piece of plastic wrap to hold the ends in place. Repeat the process for the other tenderloins. Refrigerate for at least 4 hours and up to 2 days. Preheat the oven to 400oF. Spray a roasting pan with cooking spray. Carefully remove the plastic wrap and place the tenderloins seam side down in the pan. Roast for approximately 30 minutes or until an instant read thermometer inserted in the center of the meat reads 145oF. Remove the meat from the oven. Loosely cover the meat with foil and allow it to rest for 5 to 10 minutes. *18-inch plastic wrap is available at wholesale clubs (Sam’s, Costco) or restaurant supply stores. If you can’t get wide plastic wrap, use regular size wrap. Cut two sheets of 12-inch wrap 18 inches long and overlap them from top to bottom rather than left to right. Make sure you overlap them by at least 3 inches to keep them together when you are rolling the tenderloins.